There are two types or categories where matrix multiplication usually falls under. The first one is called Scalar Multiplication, also known as the “Easy Type“; where you simply multiply a number into each and every entry of a given matrix. 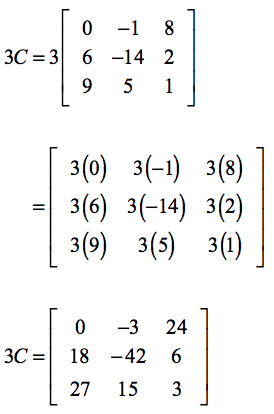 The second one is called Matrix Multiplication which is discussed on a separate lesson. In this lesson, we will focus on the “Easy Type” because the approach is extremely simple or straightforward. Here’s the simple procedure as shown by the formula above. Take the number outside the matrix (known as the scalar) and multiply it to each and every entry or element of the matrix. Directions: Given the following matrices, perform the indicated operation. Apply scalar multiplication as part of the overall simplification process. Example 1: Perform the indicated operation for 2A. I will take the scalar 2 (similar to the coefficient of a term) and distribute by multiplying it to each entry of matrix A. In case you forgot, you may review the generic formula above. That’s all there is to it. Done! Example 2: Perform the indicated operation for –3B. I will do the same thing similar to Example 1. No big deal! Multiply the negative scalar, −3, into each element of matrix B. Did you arrive at the same final answer? If not, please recheck your work to make sure that it matches with the correct answer. Example 3: Perform the indicated operation for –2D + 5F. To solve this problem, I need to apply scalar multiplication twice and then add their results to get the final answer. Therefore, −2D is obtained as follows using scalar multiplication. That means 5F is solved using scalar multiplication. 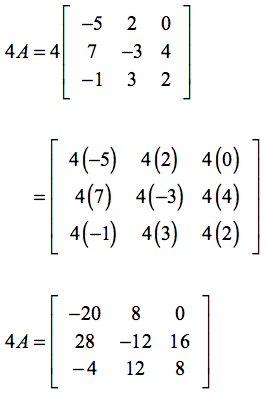 Now, I can solve for –2D + 5F by adding the values of matrices −2D and 5F, as shown above. Click here to review how to add and subtract matrices. Example 4: What is the difference of 4A and 3C? At this point, you should have mastered already the skill of scalar multiplication. The very first step is to find the values of 4A and 3C, respectively. 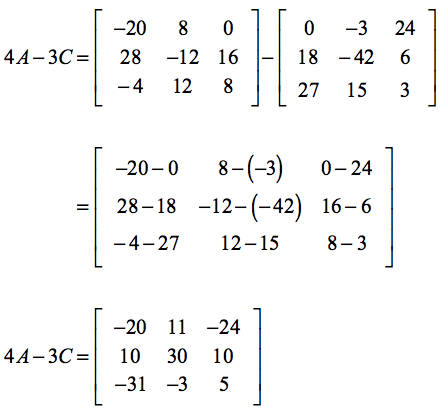 Then we subtract the newly formed matrices, that is, 4A-3C. Finally, we subtract 4A by 3C.